Who Heard it and Who Didn't? Marcia Clark: "First, there's surprising information about the 911 call that Patsy Ramsey made to police to report her daughter missing. 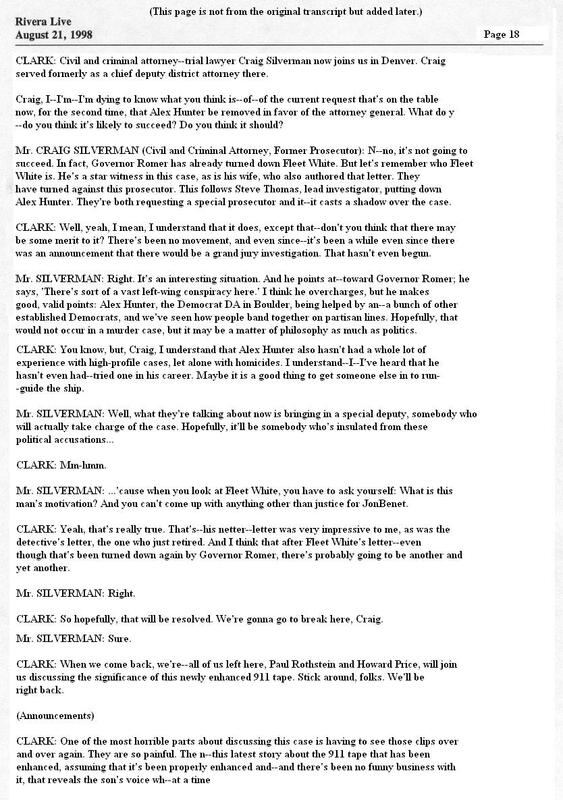 Although the Ramseys told investigators that their son Burke, then 10 years old, was asleep when the call was made, a transcript of the 911 conversation apparently shows otherwise. According to the National Enquirer, which broke the story and other published reports, Burke can be heard speaking in a newly enhanced version of the audiotape." - "Meanwhile, former close friends of John Ramsey have written an extraordinary 15-page letter asking that the people of Colorado should demand that the state's attorney general take over the case. NBC's Leanne Gregg reports on this plea for the removal of the Bouldy--Boulder County district attorney." Host: Marcia Clark, Leanne Gregg (Reporting), Guests: Craig Silverman (Civil and Criminal Attorney, Former Prosecutor), Mr. Howard Price (Criminal Defense Attorney), Professor Paul Rothstein (Attorney). 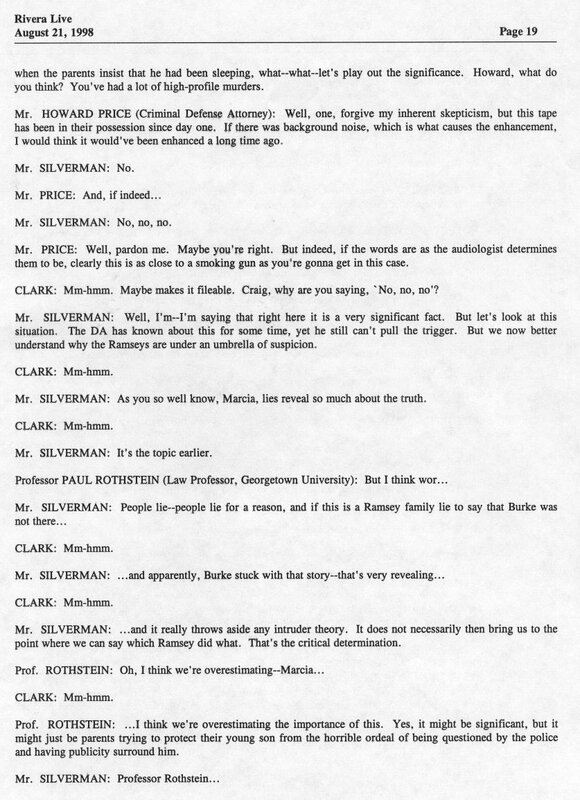 NOTE FROM WEBMASTER: A poster known as "Bailey" ordered this transcript from "Burrelle's Transcripts" back in 2000. Once she finally figured out how to use her new scanner she sent them to me (ACandyRose) and the scans were so huge that I couldn't figure out at the time how to reduce them in size and still maintain the print quality. 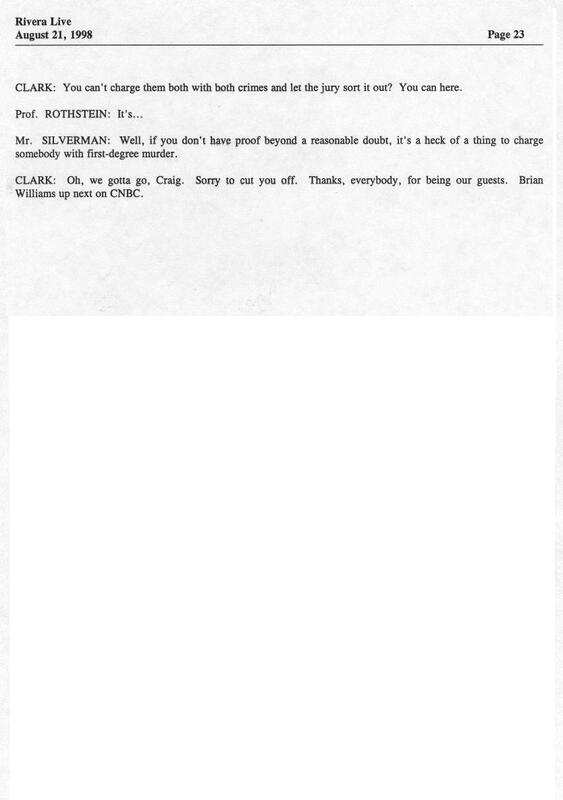 I was able to fix page 17 and that has been on my timeline transcripts page. The rest of the copies got lost on an old hard drive that I recently was able to access and resize. 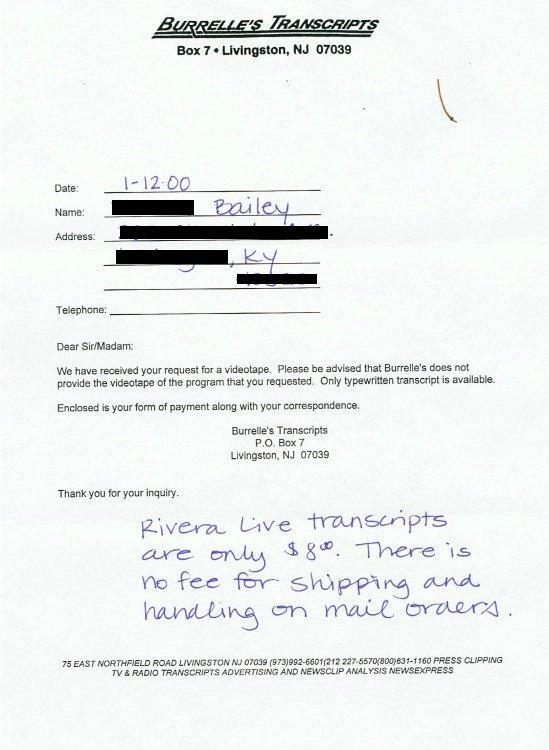 The cover sheet shows the transcripta were mailed to "Bailey" January 12, 2000 and cost her $8.00. Of the eight (8) scans that "Bailey" sent to me, there was no "page 18" and I received two of pages 17. I was able to re-create page 18 from a written transcript but that one page 18 below is not from the originals sent to me by "Bailey." All the rest are originals. BOULDER, Colo. -- Burke Ramsey was awake and asking questions as his mother phoned police to report the disappearance of his 6-year-old sister, JonBenet, officials familiar with the murder investigation said Thursday. 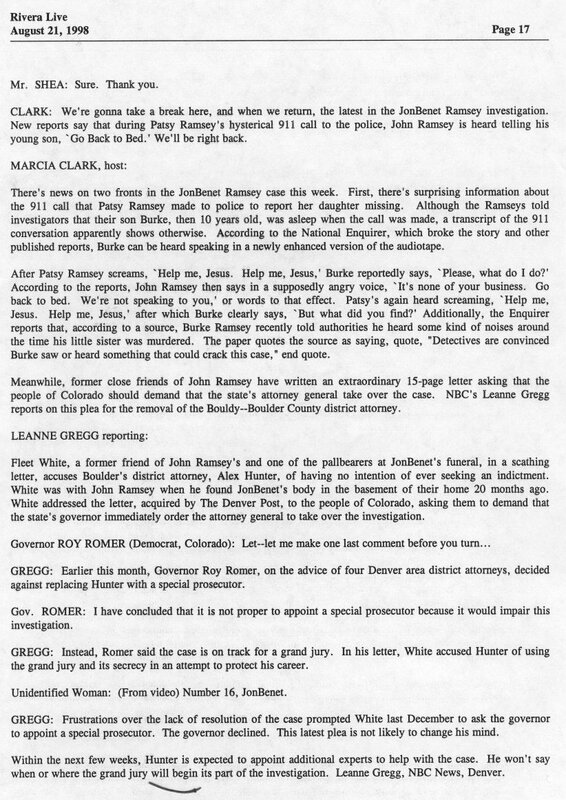 A digitally enhanced tape recording of Patsy Ramsey's early morning 911 call -- which includes Burke's voice, according to the officials -- appears to contradict statements by the Ramseys that Burke was asleep in bed at the time. Patsy Ramsey didn't hang up the telephone after placing the 911 call at 5:51 a.m. on Dec. 26, 1996, allowing a few moments of conversation between the family to be recorded, the sources said. Boulder police, who have never publicly released the 911 recording, took the tape to a California laboratory for a sound enhancement in April 1997. John Ramsey and Burke Ramsey, then 10, can be heard on the tape, according to the officials. Patsy Ramsey cries and screams, "Help me, Jesus, help me, Jesus," after setting the telephone down, apparently believing she had disconnected the call. Another voice -- identified as Burke Ramsey's -- is heard in the background. John Ramsey says to him, "We weren't speaking to you." Burke Ramsey replies, "But what did you find?" Boulder police and the Boulder District Attorney's office would not comment Thursday. But an attorney for John Ramsey blasted what he called the "vicious leak" of the 911 tape's contents. Hal Haddon said whoever revealed the information is guilty of "criminal misconduct" and should be indicted. "This vicious leak is one more example of the pattern of official misconduct which has characterized this investigation for the past 19 months," he said in a written statement. "Police sources leak what they claim is critical evidence and spin it against the Ramseys. The Ramseys are helpless to reply because they do not have access to the evidence. "The situation is a disgrace to the criminal justice system, which appears powerless to prevent it." The Ramseys insisted Burke Ramsey was asleep when Patsy Ramsey found the ransom note demanding $118,000 for JonBenet's return and when she dialed 911 to report her daughter missing, according to the officials familiar with the investigation. The couple made that statement soon after their daughter's death, and again in July during 20 hours of separate interviews with investigators from the Boulder County District Attorney's office, according to the sources. Police listed the enhanced 911 tape as one of the reasons to take the case to a grand jury during a two-day presentation of evidence in early June to District Attorney Alex Hunter and his assembled experts. John and Patsy Ramsey have steadfastly denied involvement in their daughter's death. But Boulder Police Chief Mark Beckner has said they continue under an "umbrella of suspicion." Burke Ramsey was interviewed in Atlanta in July. Beckner had said police considered him an important witness in the case. Attorneys not connected to the case had different perspectives on what the tape means. "It's significant because if this contradicts the statements of John and Patsy and Burke Ramsey, you can reasonably conclude that there was a reason for them to mislead law enforcement officers," said Craig Silverman, a former Denver prosecutor now in private practice. "It explains the 'umbrella of suspicion' that we've been hearing about, but it doesn't advance our knowledge as to what person did what," he said. Defense attorney Scott Robinson questioned whether such a tape recording would be admissible in court. He said there is not a lot of case law on such a situation. Even assuming the tape is valid, Robinson said he quickly could think of six or seven scenarios that would explain the snippet of dialog, with interpretations ranging "from the sinister to the sad and sympathetic." Hunter's office will not disclose the starting date or location for the Boulder grand jury. But sources said the 16-member grand jury would be convened sometime after Labor Day. Thread titled, "Another Foster thread"
I watched all the news shows report on the 911 tape. They never played the tape and not one reporter I saw said he or she heard them. They just were reporting on what they heard from unknown sources. Newsweek said the tapes were mud and the conversation was not there. Again, no one said they listened to the tapes themselves. You want to believe the tabloid story that Geraldo and Boyles were reporting on? You certainly have the right to do that. Just as I have the right to say I believe it is just another tabloid trash story. CBS did verify that I had the e-mails and letters - you can call the people at 48 Hours - perhaps they will verify that for you. 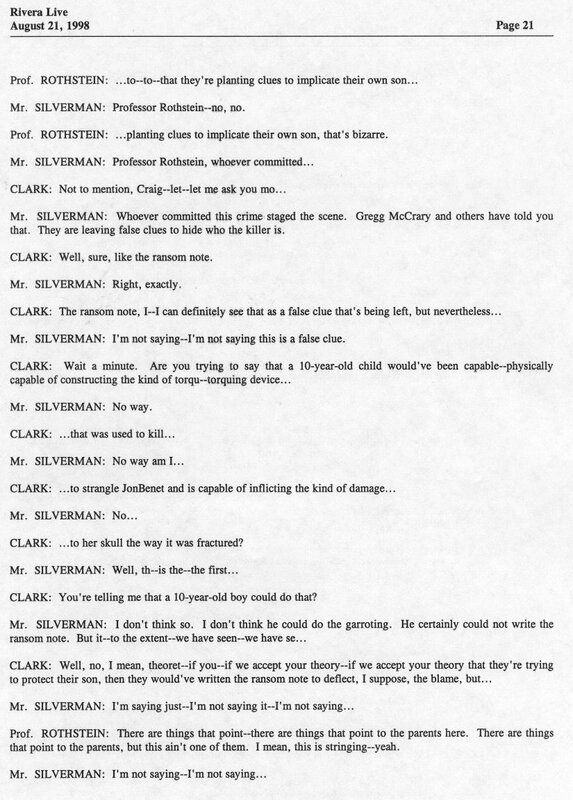 The FAX was shown on TV - they took the quote "solved this Colorado crime" out of it. Again, you don't want to believe those things exist, fine. I feel no need to share those things with you. In fact I have a good reason NOT to make those things public at this time. "You want to believe the tabloid story that Geraldo and Boyles were reporting on? You certainly have the right to do that. Just as I have the right to say I believe it is just another tabloid trash story." For the record, my sources for the veracity of the story come from the Rocky Mountain News, the Denver Post, and the Daily Camera. I put particular credence in the fact that John C. Ensslin of the RMN, while noting that the story originated with the National Equirer, independently confirmed the story. It is reasonable to believe that Ensslin did this by contacting people at Aerospace Corporation, the company where the enhancement was done. Since David Wright of the Enquirer said that no money was paid to the two technicians spoken to from the company, it is reasonable to believe that Ensslin, and the "several other media outlets" he cited, also independently confirmed the story with those technicians. In addition, I cannot ignore Christopher Anderson's (of the Daily Camera) notation in his article that, while the Ramsey attorneys were furious about the leak, they did not deny the story of the tape's contents. This would have been easy to do if there was reason to, given the attorneys' access to the Ramseys, who were in the perfect position to deny the contents of the tape since they were ON the tape. Patsy and John Ramsey have been given a copy of a 911 tape that apparently contradicts some of their statements to police, Newsweek is reporting in its June 7 issue. The tape was made Dec. 26, 1996 -- the morning that the Ramseys' daughter, JonBenet, was reported missing. She was found dead hours later in the basement of the family's Boulder home. The Ramseys told police that their son Burke was asleep when Patsy Ramsey called 911 at 5:52 a.m. that morning. But his voice can be heard on the tape, according to published reports. 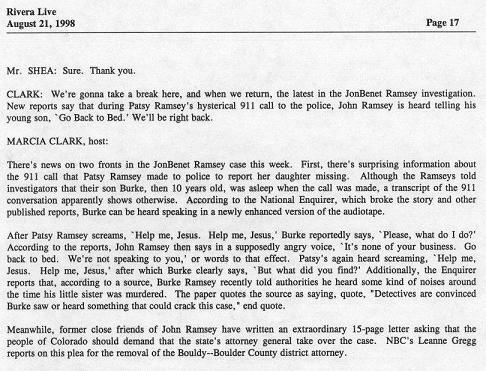 Burke Ramsey was called before the Boulder grand jury, which has been investigating JonBenet's murder since last fall. Shortly before Burke Ramsey's testimony, a judge ordered Boulder District Attorney Alex Hunter to turn over a copy of the tape to the Ramseys, Newsweek reported. In Colorado, a person testifying before a grand jury is allowed to see any "prior statement" he or she made. From a poster known as "Spade" on the Forums For Justice forum came the information regarding a person known as "Bonita." Spade: "Bonita is the 1st name of the legal secretary who wrote up the Boulder Police reports, mailed them to her nephew in Oregon who in turn double-dealt them to two tabs for $70,000. Bonita had access to all the BPD reports. Keep in mind that Bonita wrote-up her info in 1999"
"While re-listening to the recording of the 911 call made by Patsy in the early morning of December 26, detectives thought they could hear a conversation in the background while Patsy was attempting to hang up the phone. On April 21, Det. Melissa Hickman flew to Los Angeles to meet with Mike Epstein and Jim Roeder, engineers at Aerospace Corporation, for purposes of enhancing the recording of the 911 call received at the Boulder Regional Dispatch Center. When Hickman returned to Aerospace the next morning to meet with Roeder, he said that he had continued listening to the disk after Hickman had left for the evening. He and another engineer had played the original version of the 911 call that had been transferred to the JAZ drive and found that to be the clearest recording. Both engineers had heard three distinct voices on the tape and written down that they thought was being said. The tape was then played for Hickman. After listening to the tape three or four times, Hickman heard John Ramsey say �We�re not speaking to you�. In what sounded like a very angry voice. 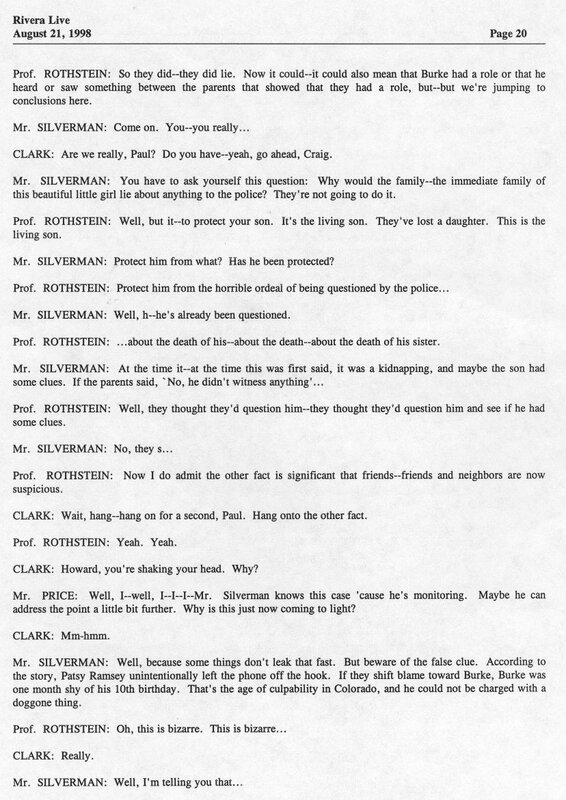 Patsy then says, �Help me Jesus, help me Jesus,� and finally Burke is clearly heard to say, � Well, what did you find?�, with an emphasis on the word �did.� After Hickman told the engineers her impression of the conversation, Roeder handed her a piece of notepaper containing the conversation heard by himself and his fellow engineer � the conversation as written down was exactly as Hickman herself had just heard." Thread, "the 911 tape was NOT heard!" We recieved your request for a videotape. Please be advised that Burrelle's does not provide the videotape of the program that you requested. Only typewritten transcript is available. Enclosed is your form of payment along with your correspondence. - the tape was not played. Thread titled, "Geraldo 911 Tapes"
I thought I'd start this new thread on the Geraldo 911 tapes that I said I would be able to get - they are ON their way!! There were two shows (I'm told) that covered the 911 tapes. One ws hosted by Marcia Clark and the other by Geraldo. One was Friday 8-21-98 (Marcia) and the other Gerald 8-25-98. (from my source that's sending me the tape): they NEVER played the tape. Geraldo mentioned that he was reporting what was stated and the magazine that first reported the existence of the enhanced 911 tapes. It was the National Enquirer. One of the guests on his show questioned the source but Geraldo said it was a better source than the Washington Post. From: Somewhere under the hole in the Ozone. I'll be the first one to tell you that I swore up and down that I heard those tapes on Geraldo. I was determined to prove it, so I called my cousin who works for the company that produces Geraldo. Guess what she says? The tapes never aired, what I heard was a dummy tape. A dummy tape, according to her, is a renactment. "DATELINE TO PLAY 911 CALL TUESDAY"
Finally, someone has found PROOF that those of us who have been swearing for years online we heard the 911 tape on TV were not delusional, lying, or in some kind of state of mass hypnosis. Thanks, VP, at FFJ, for finding this. I looked for some proof for a long time, even called the number for "Geraldo" show tapes and a nice woman there looked and looked for it, but never could I find any reference to the playing of the tape. I don't know how you found it, but thank you so much. There are also some great articles posted at FFJ about when the tape was "leaked." Those articles are further proof that there are other voices on the tape. I personally couldn't quite understand what was being said, just heard two other people, and one sounded like a child. Geraldo played it a few times, and then his guests and he discussed it. It was in 1998, apparently, but I didn't remember that because by the time I came online, in 2000, it had been awhile. I was shocked to see how big of a controversy the tape was when I'd already heard it. So I said I heard it and I might as well have said I played gin with Martians, because those who didn't hear it or know about the playing of the tape acted like I was hallucinating. Many posters besides me have said we heard the tape played on TV. I honestly didn't remember if it was the "enhanced" tape or not because at that time Thomas' book wasn't even written, so all I knew was that the tape was played and I heard it, voices at the end and all. I wasn't online at all when I heard it, just following the case through the books and TV. I heard it, I knew I heard it, but many people acted like those of us who heard it were just nutz. Now Jams is saying the same thing at the swamp. I hope others will take this to other forums, as the Tuesday event on "Dateline" is sure to be more Ramsey spin that there are no "voices" on the end of the tape. BS. I heard them. Others heard them. But it was the ENHANCED TAPE we heard. Not to worry, KK...I remember my sisters swearing they heard the tape. Now it makes sense...being played on Geraldo. They don't work and so they would have caught the show. Personally, I don't think they're going to play the enhanced tape. Not if Lin Wood is involved. He swears to God Burke was in bed and the BPD made it all up. However, Lin Wood HAS heard the enhanced tape and guess what? Nothing. That would be wonderful if Nancy Grace filled in for Larry. Or hope a more newsworthy event happens. BTW, I also heard the enhanced 911 tape way back. My daughter was watching with me. "JANN SCOTT A MUST READ"
That is exactly the case, Sabreena. I HEARD the enhanced version on Geraldo. I was so angry that I hadn't turned on my VCR and captured that particular show. The next AM, the BPD threatened suit that GR had basically stolen evidence, and that all references to said voice clip must be erased. I went to the transcript site, and both the tape and the transcript had the entire episode taken out. I am STILL kicking that one. When they showed that night in reruns, they said NOTHING except the evidence was stolen, and as an ongoing case, it was held evidence, and not for public consumption. Well, thank you Maeven! I've been fighting tooth and nail at WS because most just can't get it that it was played on Geraldo and that I heard it. Then Candy comes on with a transcript of a Fox show Geraldo did last week talking about the tape like he never heard of it. I sent him an email telling him just what a SNAKE he is and that he's lost any integrity I've gave him credit for having. I still will not budge. I heard the enhanced tape on Geraldo and that's a fact. I wasn't online back then and didn't tape any of the things I saw on the case, as it was just me interested in it around my friends and family. Plus, I had no way of knowing that it would never be solved and I'd be here all these years later.... Who knew? But I completely missed the part about the threats to Geraldo. I just watched the one show, then went to bed. I finally figured out when I came online and people acted like I was nutz for saying I heard it, and when I couldn't find any reference to it anywhere, that must be what happened. Let me clarify one point I didn't make well. I don't think Geraldo played THE ENTIRE 911 tape. I believe what he played was just the end, the enhanced portion. That's all I remember, at any rate. So him saying now that Couric had the "exclusive" in playing the tape would be correct as far as the ENTIRE tape she played. He only played the end, with the enhanced voices, as I remember it. 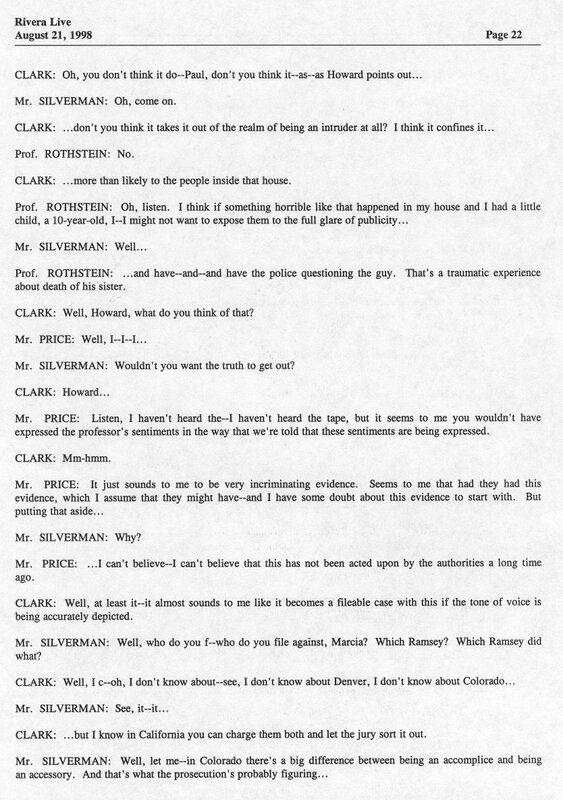 That Rivera program was a discussion of the Burke tape bombshell, but the 911 call was not played in any form. Everytime this subject comes up I urge folks to contact Geraldo or his producer. I know what they'd say, but invite others to make the call and find out for themselves. Of course, then the believers will say it was some other program. I also have told people to contact Larry Schiller and ask if he ever heard the 911 call in any form, prior to a few months ago. If anyone was privy, way back when, it would have been Schiller. As far as I know, no one has communicated with him and reported his comments. Also, people still in touch with Steve Thomas should verify with him that the call was never released. There are knowledgeable individuals who can put this mess to rest. I don't know why they're not being asked unless there's some joy in seeing a piece of bad information remain on the table. It's an annoying matter to me as it's one thing that, if true, would be a total breakdown of ethical behavior on the part of law enforcement. I'm absolutely satisfied this didn't happen. I am one of those fools who believes he heard the enhanced 911 tape and remembers being shocked by the tone of John's voice. The Boulder DA claims that the enhanced tape has never been released and we all know their reputation for sticking to the literal truth. BUT, just to be sure, I have ordered the transcript of August 21, 1998 Rivera Live. thread titled, "Gene Wallis Parker"
Well, this makes good sense to me. "As most of you know, I'm the one that first stated (at JW) that I had heard the extended 911 call. I know I heard it and I will never forget the anger in John's voice. He was mad not concerned or anxious about his missing daughter. I can clearly imagine Patsy taking over the situation and telling him what they would and would not do and that if he didn't agree she would tell the world what really happened. SHE was the one that called the police. SHE was the one that called the other friends over. SHE, I believe, was the one that wrote the ransom note. Take another look at it. Read the anger the writer displayed towards John. That was a personal thing, not the work of a stranger. "Use that good old Southern common sense John"...those are her words. Words she had used often in the past... words that, consciously or subconsciously she used to point to the real monster in this case." Last edited by Twitch : January 18, 2004, 4:38 pm at Sun Jan 18 16:38:57 CST 2004. I took so much grief about that I have tried to put it behind me. I tried to investigate it some but got nowhere. I think it might have been Inside Edition. If anyone has a copy of the JusticeWatch CD I posted all of the info I had there. RiverRat and some others heard it and they might have more details. Last edited by Twitch : January 19, 2004, 12:36 am at Mon Jan 19 0:36:01 CST 2004. I think the other possibility I had narrowed it down to was Hard Copy. If you have read this a million times turn away now!!! At the time it aired I was getting Directv and local cable. At the time Directv aired local affiliates from all 4 networks throughout the country. So, even though I live in Georgia, I got local programming from stations in NYC, Washington DC, LA, Denver, etc. through Directv and my 4 local affiliates through cable. DTV would change these affiliates from time to time and at the time it aired I was getting an Erie, PA affiliate and I think that might be where I saw it. I contacted this affiliate and they told me the name of the syndicated show they were airing at that time. I have tried tonight to link this to something else that was going on at the time but I can't. When I first posted it at JW Ruthee was still alive. Jellyjaws and I posted back and forth about it on the daily. DOES ANYBODY OUT THERE HAVE A CD OR PRINTOUTS FROM JW THAT MIGHT CONTAIN THIS INFO? If I did keep a print copy of the emails I sent and received re this I have long since thrown them away or misplaced them. Sorry. Last edited by Twitch : January 19, 2004, 12:37 am at Mon Jan 19 0:37:35 CST 2004. I don't know about that poster Rat. I do know that there was a poster at JW named Janphi who had some sort of journalistic credentials or connections. She posted that she believed she had heard that the tape was aired once and then there was some sort of legal injunction filed to prevent it being aired again. I tried to search over the internet for some evidence of an injunction but with no luck. Quite honestly I didn't even know what sort of court it would have been heard in. I addressed this on another thread. The date was August 17, 1998. I had turned on the TV in anticipation of Bill Clinton's apology speech. I was packing to go away on vacation, so I was in and out of the TV room, and heard the enhanced tape "with one ear", as it were. I was not able to follow up on the forums for the next few days as I was AFK and computerless. (That was before I had a laptop). I heard the ENHANCED 911 TAPE ENDING played on Geraldo's NIGHT SHOW..."Geraldo Live" I think it was called. And only the enhanced ending was played, (not the first of the call with Patsy and the dispatcher). I do not remember the time except that I was not on online at the time so it had to be before May of 2000. I posted about this at JW when I was a member for a few months in summer of '00, surprised that people didn't seem to know it had been played on TV. I had no idea before that time that it had been dumped and covered up. It was just something I heard one night while watching Geraldo as per usual, and it was only a short part of the show. I had no reason to think it was some big deal that would go down in history as a controversial subject because of a coverup the likes of which I have never seen before which I personally know is a fact. People believe what they will. I know what I saw and heard. That's a fact I KNOW. Others apparently heard it on one of the magazine shows like Hard Copy or Inside Edition. Since TV affiliates often share stuff like this, as they are owned by the same parent companies, this is entirely plausible. I just heard it on Geraldo's night time show, so if Adrian has the contacts to look into this, please do! I only decided to stick my neck out again on this because others were doing so, also, and if they're willing to try once again to find the truth about it, it seemed the least I can do. I am STILL kicking that one. When they showed that night in reruns, they said NOTHING except the evidence was stolen, and as an ongoing case, it was held evidence, and not for public consumption. Whatta CROCK! !